Shark fin soup was once a delicacy reserved for special occasions but a 2006 study conducted by Fisheries Scientist Shelley Clarke indicates that up to 73 million sharks are now being killed annually to supply the fin trade. This is three times higher than the official catch statistics reported to the FAO because it includes new data taken from illegal shark fin traders who do not report their catches. The soup’s increasing popularity is linked to the continuing growth of the Chinese economy. Now that more people can afford to buy shark fin soup, the demand has sent the price of fins sky rocketing. This has led to an increase in shark finning activity that is putting stress on shark populations all over the world. The act of shark finning is extremely barbaric. As the sharks are dragged onto the boat their prized fins are sliced off. To avoid losing precious cargo space, the valueless carcasses are then tossed back into the sea where, unable to swim, they sink to the seabed and drown. This wasteful practice has been outlawed in many countries including the USA but policing the shark fishing industry is very difficult and illegal shark finning fleets continue to drive shark stocks towards extinction. The problem is that sharks grow very slowly. Some species can take more than 20 years to reach sexual maturity which means that they run a high risk of being caught before they are able to produce the next generation. Sharks also have very few offspring. Unlike bony fishes that release millions of eggs each year, sharks incubate their young internally and only give birth to between 1 and 50 pups depending on the species. Of these, only a few will survive the first year. As the ocean’s apex predators this reproductive strategy serves them well. Their low birth rate ensures that they will not overrun their food supply but unfortunately it also means that they are unable to respond to increased fishing pressure. A recent study in the Gulf of Mexico found that the Oceanic Whitetip Shark population has been reduced by a staggering 99 percent and researchers speculate that many other shark species are in a similar position. To combat rampant shark finning the IUCN Shark Specialist Group has proposed a limit on the fin to body weight ratio of landed sharks. 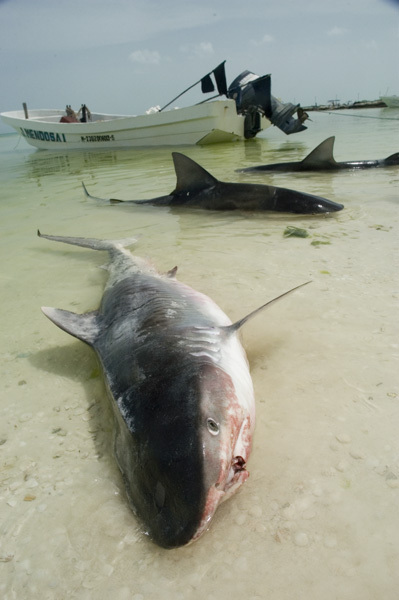 This discourages shark fishermen from discarding carcasses at sea but it does not specifically limit the number of sharks that they may land. 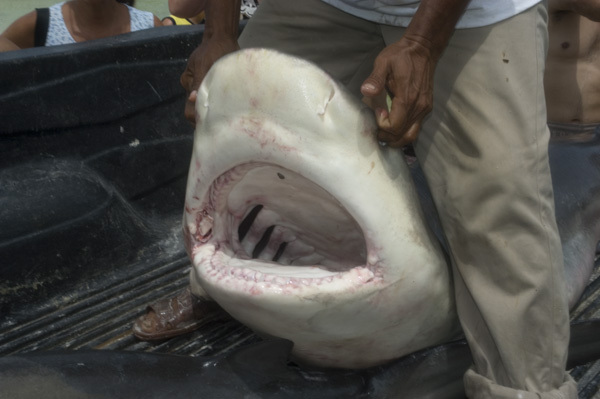 It is a band aid solution that has slowed down some shark finners but it has driven others underground. While monitoring the shark fishing industry is important, educating consumers is just as critical. Sharks are vanishing from our oceans at an alarming rate and the outlook is not an attractive one. Without sharks, the incidence of disease among fish species will increase. Some marine populations will explode leading to crashes among others and the eventual breakdown of the entire marine ecosystem. A high price to pay for a bowl of soup.